Delivering The Post on Christmas Day – in Newcastle West long ago! Michael Healy served as postman in Newcastle West for 45 years from the early Thirties until the Seventies. In this article, which he wrote for the Newcastle West Historical Society Journal, The Annual Observer, published in July 1979, he recounts the vicissitudes of the job and why he wasn’t sorry to see the Christmas Day deliveries come to an end. One of the Post Office services no longer available is the delivery of mail on Christmas Day. We haven’t had it for many years. To the older generation this is something to be regretted; a nostalgic yearning for the passing of a custom that lent a Dickensian flavour to the Festival, akin to the star on the Festive Tree, Christmas carols and robins pecking crumbs in the snow. But, to the unfortunate postman, Christmas Day was the most arduous of the whole year; consequently, the abolition of the Christmas Day deliveries was greeted by all and sundry in the postal service with considerable relief. Our working day in the early 1930’s began around 7a.m. 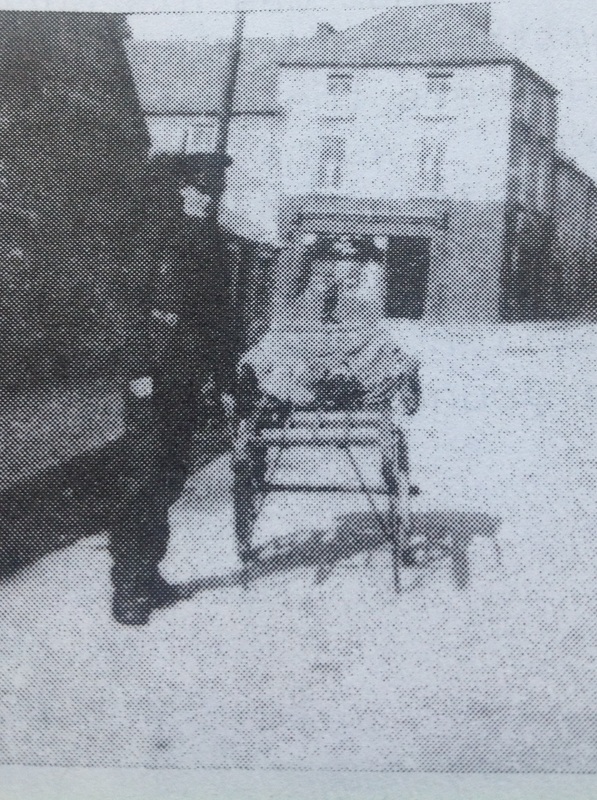 It was part of my duty to meet the 7.15 morning train from Limerick and transport the Newcastle mails in a handcart to the Post Office in Bishop Street. This meant being at the railway station at 7.15 on the dot, summer and winter, as the train halted in Newcastle for a mere ten or twelve minutes and a Post Office Official (the grandiose title for a thirty shilling a week postman) had to be on hand at this ungodly hour for reception of the mails from the carriers, the Great Southern and Western Railway, else he might find himself forced, at his own expense, to follow the train to Listowel to collect the mailbags. The mail, in the 1930’s, was comparably small; a mere eight or ten sacks. In those halcyon days, it never entered your head that you might be molested and robbed by a bandit in the dark of a winter’s morning, so the duty was easy for an early riser. The Christmas Mail was something different. Before the intrusion of high-pressure brain-washing, there were no appeals for early posting at Christmas, so why post a week earlier? This meant mail descending in shoals on every Post Office in quantities that would seem impossible for delivery in one day. Often the increase in numbers could be as high as ten or fifteen times an ordinary Mail. There being no 7.15 Limerick Train on Christmas morning the Mail was sent to Newcastle in a huge lorry. Instead of 7.15, the lorry was usually an hour later. The chaos began trying to take the Mail out of the vehicle. The volume (comparably) was enormous, sixty or seventy huge bags. These had to be disentangled from the Abbeyfeale and Listowel Mail, as the lorry driver, on a once-a-year job, hadn’t a notion of making it easier. The primary aim was to divide the mail for the adjoining sub-offices, which had to be ready around 9.30 or 10 a.m., when the late Dinny McAuliffe R.I.P., or one of the other local hackney drivers, took the mail to Tournafulla, Kilmeedy or Knockaderry etc. The completion of this task depended on the American Mail. By some devilish twist of fate the White Star and Cunard Lines seemed to arrive in Cobh just before Christmas to scatter thousands of tons of Christmas Cards all over Munster. Most people looked forward to hearing from relations in America and in the hungry Thirties the United States’ dollars were doubly welcome. The American Mail on Christmas Morning was often equal to what you’d normally deliver in a week. When the Mail was divided, each man had to put his letters and parcels in order for house to house delivery. As an instance of what this could mean I had one house in my delivery with fourteen children, some grown up some toddlers, they all seemed to get cards and the total for this house on Christmas Day was never less than 70 or 80 items. And I had almost 200 houses on my delivery. With this amount of preparation, the day was usually half over before you were ready for the road, and the three or four hours overtime allowed was already squandered leaving only the normal six hours. If you got going at noon this meant only four or five hours daylight for delivery. Christmas Day, for Christians, was obviously one of the holiest days of the year, everybody went to Church. But if you were a Postman – you didn’t – you couldn’t, you had to work. Knowing the brief period of daylight one started off with little delay. Even though you probably had nothing to eat since an early 7 o’clock breakfast the temptations of offers of roasted goose or ham or even cups of tea had to be ignored. Eventually, hunger compelled you to accept some householders hospitality, meanwhile keeping an eye on your watch to waste as little time as possible. To rural dwellers, the Postman was (and probably still is) treated like a distant cousin or a lifetime friend. Then it was the custom to show this friendship with hearty Christmas hospitality. There was a limit to the amount of turkey, ham, goose or fruitcake you could take. But the bane of this form of conviviality was the man who took your arm in an iron grip and insisted you must have a little drop of something. The arrival of the Postman with Christmas Mail always aroused intense excitement, especially in households with young people. Letters were handed around, the children’s toys had to be admired, and somebody always remembered the Postman’s Christmas Box. Being almost one of the family, nobody minded asking the Postman to do a favour during the year; bring a message from town, call with a message to the Vet or to a neighbour. These favours were not forgotten at Yuletide and the Christmas Box seemed to give even more pleasure to the donor than the recipient. But then there was always the few who felt your Christmas Box should be a drop of the hard stuff or a few bottles of stout. These worthies always seemed to have the kitchen and parlour littered with cases of liquor and if you were unfortunate enough to have had one drink earlier and they smelt it, then it was a personal insult if you didn’t share their generosity. I have often been told, ‘so-and-so, when he was delivering before the war (the 1914 one), would always have a bit of the goose at Christmas and three or four bottles of stout’. One of these robust Postmen was reputed to partake of a hearty meal whenever offered and of course three or four or more bottles of Guinness. Thus fortified, if there was a gramophone or a melodeon player available would often organise a half-set, or waltz the housewife around for a spell before setting off on his rounds again. With 200 or more houses to deliver one might expect he’d hardly return before the New Year. Yet he was always home stone sober with all his Mail delivered as early as seven or eight o’clock. They were giants in those days! The weather on Christmas Day was always most important, especially on the Post, endeavouring to race with the few hours of daylight one needed a dry road, and dry hands; nothing more messy than handling letters in the rain. Nature seemed always kind; in 45 years I can hardly recollect 5 wet Christmas Days. Wet or dry you suddenly realised with horror that darkness was coming. Usually by then, around five o’clock, one might still have another 40 houses scattered over 7 or 8 miles to deliver. Then was no time for accepting hospitality, nor indeed for being very genial, when in the dim light of an acetylene lamp you negotiated rough passages, struggled with immovable gates and quarrelled with snarling sheepdogs, who insisted you couldn’t be the Postman at this hour of evening. Sometimes you might have to knock three or four times before somebody came to a doorway; people were beginning to lose hope of any Christmas Mail after darkness. One occasion, after waiting impatiently for an answer to repeated knocking, I pushed open the kitchen door to find the whole family on their knees reciting the evening Rosary. What could I do? At Christmas? I dropped to my knees and joined in, hoping in my heart they had reached the fourth or fifth decade (actually it was the second)! Coming home, your path might cross a Postman from a neighbouring route. Then you thought your day was terrible, listen to his, etc. etc. Most of the men were back between seven and 8 o’clock and without expecting much sympathy, stories of their various misfortunes were bandied about before finishing work. One had been bitten by a dog. Another fell off his bike. Then there was the man who crossed a footbridge over a stream and coming back walked into the river up to his knees. He showed you the ends of his pants still wet. And the punctures – every year somebody got a Christmas Day puncture. Then there was the man who got home always early on Christmas Night. He never accepted hospitality and hence didn’t delay on the road. One particular year we found out why. He could never eat with his dentures in and of course, had no trouble taking them out at home. He had the misfortune one Christmas Day of getting so hungry at five o’clock that he accepted an offer of a sandwich and a cup of tea. Taking out his teeth and putting them aside he hurried the meal and hastened away to finish his route. What was his horror to discover when he returned to the Post Office that he had forgotten his dentures and horror of horrors he couldn’t remember where he had the meal and where they were left. He told me it was well into the New Year before he found them. As he said, ‘You’d be ashamed to inquire from anyone if you left your teeth at their house on Christmas Day’. We did indeed child! We did indeed! Postmen outside Post Office circa 1935 L to R: Denis Moylan (Postmaster), Dinny Hunt, Pat Keating, Tommy Sheehy, Danny Roche, Charlie Haynes, Jackie Sullivan and Jackie Hunt. Information gleaned from ‘Newcastle West in Close Up – Snapshots of an Irish Provincial Town’ published by Newcastle West Historical Society (2017). Previous Article Christmas in Maiden Street – ‘in the good old days’!